Modifying and optimizing engine control parameters to work optimally with pure HVO-type (Hydrotreated Vegetable Oil) renewable diesel, such as Neste MY Renewable Diesel, offers untapped potential to reduce fuel consumption as well as carbon dioxide and other regulated emissions. the ability to reduce nitrogen oxides (NOx) by up to approx. 30%. The results are based on a comparison between figures from the use of the engine optimized for Neste MY Renewable diesel and the use of conventional fossil diesel in the same engine, optimized for typical European EN 590 fossil diesel operation at Euro 6 emission level. The emission measurements were carried out before the catalytic converter and diesel particulate filter (DPF). The results are dependent of the chosen engine, and the improvements may not all be achieved simultaneously. The listed figures only apply to Neste MY Renewable Diesel, a paraffinic fuel fulfilling EN 15940 standard specifications. Similar figures could be expected from the engine optimization for other HVO-type renewable diesels, but cannot be generalized to conventional biodiesels. "This study by a leading expert body showed that optimizing an engine for Neste My Renewable Diesel offers benefits, such as potential to reduce fuel consumption and carbon dioxide emissions. 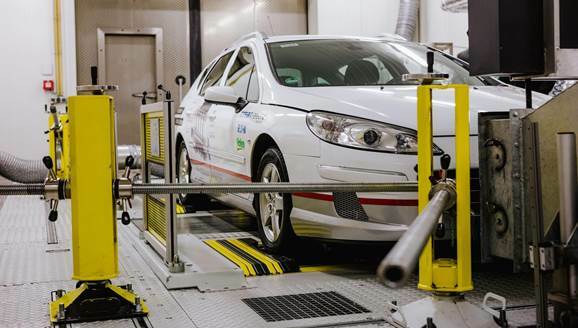 With the right calibration, it may additionally help reduce exhaust gas emissions," says Markku Honkanen, Head of Technical Services at Neste. "Engine optimization for HVO-type low-carbon fuels provides engine manufacturers an additional tool to improve efficiency and realize tailpipe emission compliance under real driving conditions, such as required in the Euro 6 standard valid in Europe," Honkanen says. The study explored the potential to lower fuel consumption without compromising engine performance or increasing the noise level or emissions of nitrogen oxides (NOx limit of 80 mg/km is set in the Euro 6 emission standard) when compared to an engine optimized for a conventional fossil diesel. Optimizing the engine for Neste MY Renewable Diesel reduced fuel consumption and nitrogen oxides emissions without affecting the high performance or low noise levels required for premium engines. Different engine construction components and engine control parameters were tested to identify optimal engine parameters for Neste's renewable diesel. In addition to engine testing, the results were finally verified through carrying out measurements in an actual vehicle in a laboratory setup simulating real life conditions and certification test procedures. The best results were reached by modifying only the engine control parameters, such as fuel injection control (timing, injection pressure and volume), the air volume, and the exhaust gas recirculation volume and strategy. The study was assigned by Neste. What is the difference between renewable diesel and conventional biodiesel? Are local emissions of diesel cars as bad as claimed? The FEV Group, headquartered in Aachen, Germany, is an internationally recognized vehicle development services provider. FEV's expertise ranges from consulting to the development and testing of innovative vehicle concepts through readiness for serial production. In addition to traditional engine and transmission development, vehicle integration, calibration, and the homologation of state-of-the-art gasoline and diesel engines, increasing importance is being placed on the development of hybrid and electric powertrains as well as alternative fuels. FEV experts focus on the advancement of electronic control systems, as well as connected vehicles and automation. The "FEV Software and Testing Solutions" product portfolio complements these services with cutting-edge test fields, measuring equipment and software solutions that help make the development process more efficient and transfer significant process steps from the road to the test rig - or even to computer simulation. FEV offers services to its transport industry customers around the world, and employs over 4,300 specialists in high-tech development centers at 35 locations on four continents. Neste MY Renewable Diesel, a low-carbon biofuel, helps our customers reduce their carbon footprint.